Bee Propolis we have includes: raw propolis and propolis extract 75% also known as tincture. 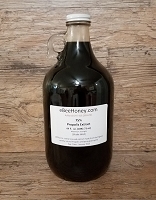 Raw Propolis is propolis that is scrapped directly from the beehives by beekeepers - raw propolis by it's very nature is very sticky so many folks prefer to buy propolis in the tincture form. The raw propolis is taken off hives in Ohio. We are sold out of raw propolis until the Fall 2018. CAUTION: Please inspect the raw Propolis since it is raw. Raw Propolis is removed from the frames within a beehive and then placed in water. We've done this 3 times to remove any debris we've seen such as small pieces of grass, leaves, even small pieces of wood from scraping the frames, etc. We then agitate it within the water and remove the material that is floating and not propolis. But anything heavier than water or well coated with propolis will still remain and if we don't spot it, it will still be in the raw Propolis. Bees coat almost everything in the hive with Propolis to protect themselves from disease, so if a small stone or anything foreign gets in there, they will coat it with the Propolis and would be invisible to the human eye. So please, double check it prior to consuming and if one decides to chew it, do so with caution. Propolis is also very sticky and will stain like iodine so don't place it on a countertop, etc. without having something underneath it to protect any surface. For honey bees, propolis is used as a kind of glue. They use it to seal cracks and crevices in the hive to make it less drafty when it is cold. Propolis is sticky when it is warm and it is difficult to deal with when it is hard. 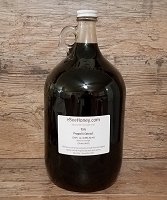 Propolis tincture is processed from the highest quality propolis in a whole grain alcohol and extracted into the alcohol. It is highly concentrated (75%) and highly potent. Propolis Extract - 75% - 4oz.